Andrews McMeel Publishing, 9780740715549, 224pp. 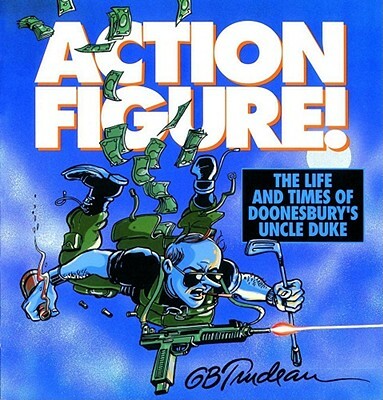 Hot on the heels of his surprising in-your-face presidential campaign, the roots of candidate Duke are revisited in this reissue of Action Figure!, the definitive history of his adventures from 1970 to 1991. The perennial bad boy of American comics has always been a man of action: libelous action, irrational action, covert action, back-street action-even when comatose, he has a certain flair. Duke is the man of a thousand vices, with almost as many pages to his resume. For 17 years, from Samoa to China to Panama to Kuwait, wherever serious mischief was being dealt, Duke has been a major figure. Action Figure!, gives the Toasted One his due-one vast, staggering flashback that tracks his careening career from Gonzo Journalist to Governor, Ambassador, Coach, Laetrile Farmer, Fugitive, and Zombie. No risk has been too great, no prospect too strange, to sway the man with nerves of steel from his random course. G. B. Trudeau has been drawing his Pulitzer Prize-winning comic strip for more than forty years. In addition to cartooning, Trudeau has worked in theater, film, and television. He also has been a contributing columnist for the New York Times op-ed page and later an essayist for Time magazine. He is a fellow of the American Academy of Arts & Sciences. He lives in New York City with his wife, Jane Pauley. They have three grown children.